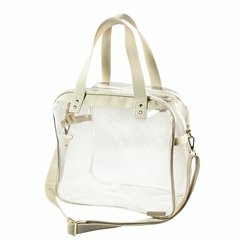 The Carryall Tote features a clear body with classic accents of coated cotton canvas and gold hardware. Carry the bag easily with your choice of double handles or the adjustable, detachable shoulder strap. The main zippered compartment is perfect for storing your essentials on gameday or at your secure workplace.